Giovanni Ponti (18 November 1891, Milan – 16 September 1979, Milan), usually called Giò Ponti, was one of the most important Italian architects, industrial designers, furniture designers, artists, and publishers of the twentieth century. 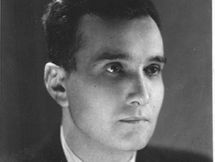 Ponti's parents were Enrico Ponti and Giovanna Rigone. He did military service during World War I in the Pontonier Corps with the rank of captain, from 1916 to 1918, receiving the Bronze Medal and the Italian Military Cross. Giovanni Ponti graduated with a degree in Architecture in 1921 from the Politecnico di Milano University. Also in 1921, he married Giulia Vimercati; they eventually would have four children and eight grandchildren. Ponti began his architectural career in partnership with Mino Fiocchi and Emilio Lancia from 1923 through 1927, and then through 1933 with Lancia only, as Studio Ponti e Lancia PL. In these years he was influenced by and associated with the Milanese neo-classical Novecento Italiano movement. Output of the time includes the 1925 house on Via Randaccio in Milan, the 1926 Bouilhet villa in Garches, Paris, the 1929 Monument to the Fallen with the Novecento architect Giovanni Muzio, the Casa Rasini apartment blocks in Milan, and the 1930 Domus Julia–Domus Fausta complex on Via Letizia. Around 1933, Ponti ended his relationship with Lancia and teamed with two engineers, Antonio Fornaroli and Eugenio Soncini, to form Studio Ponti-Fornaroli-Soncini which would last until 1945. Their first major commission was the 1936 company headquarters for the Italian chemical firm Montecatini, followed by a number of other industrial and university commissions through the war years, offices for Fiat, and the Palazzo del Liviano for the University of Padua in which Ponti himself painted frescos. Ponti in 1950 won the commission to design the 32-story Pirelli Tower in collaboration with Pier Luigi Nervi and Arturo Danusso. This was the second skyscraper built in Milan, and likely the climax of Ponti's entire career. Construction began in 1956. In 1951, Ponti designed the master plan, and two individual block contributions, for the IINA l'Istituto Nazionale per le Assicurazione) Casa quarter housing project in Milan. In 1952 he went into partnership with the architect Alberto Rosselli (Studio Ponti-Fornaroli-Rosselli, P.F.R. : 1952–1976); after the death of Rosselli he continued to work with his longtime partner Antonio Fornaroli. 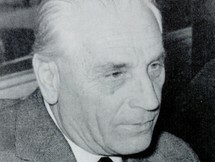 From 1953 to 1957, he built the Hotel della Città et de la Ville and the Centro Studi Fondazione Livio e Maria Garzanti, in Forlì (Italy), by the assignment of Aldo Garzanti, a famous Italian publisher. 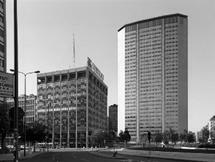 As the Pirelli Tower attracted more attention, international commissions came in to Ponti's office, for Caracas, Venezuela, ( Villa Planchart), Baghdad, Hong Kong, Eindhoven and the 1971 Denver Art Museum, and finally a series of Milanese churches: San Francesco in 1963, the church at Ospedale San Carlo in 1967, and the Taranto Cathedral in 1971. In 1923 Ponti made his public debut at the first Biennial Exhibition of the Decorative Arts in Monza, which was followed by his involvement in organising the subsequent Triennial Exhibitions of Monza and Milan. - The preliminary design for Reed & Barton's "The Diamond" flatware (1958), adapted for production by designer Robert H. Ramp. - Chairs: among others, he worked for Cassina designing an angular armchair, named "Distex", and the very famous 1957 "Superleggera" (Superlight) chair, which was very strong but also so light that it could be lifted up by a child using just one finger. Also very famous is the "Due Foglie" sofa. - Glass bottles: he designed stylish, colourful glass bottles for various companies such as Venini. - Lamps: for companies such as Artemide, Fontana Arte, and Venini, he created two types of lamps: those provided with very shining, intense colours, and those with a minimalist aesthetic, simple and essential. Among the latter, one of the most famous is the "Billia" lamp, which looks modern today while it was designed for Fontana Arte]in 1931. In 1928 he founded Domus magazine. In 1941 he resigned as editor of Domus and set up Stile magazine, which he edited until 1947. In 1948 he returned to Domus, where he remained as editor until his death. From 1936 to 1961 he worked as a professor on the permanent staff of the Faculty of Architecture at Politecnico di Milano University. In 1934 he was given the title of "Commander" of the Royal Order of Vasa in Stockholm. He also obtained the Accademia d'Italia Art Prize for his artistic merits, as well as a gold medal from the Paris Académie d'Architecture. Finally, he obtained an honorary Doctorate from the London Royal College of Art.